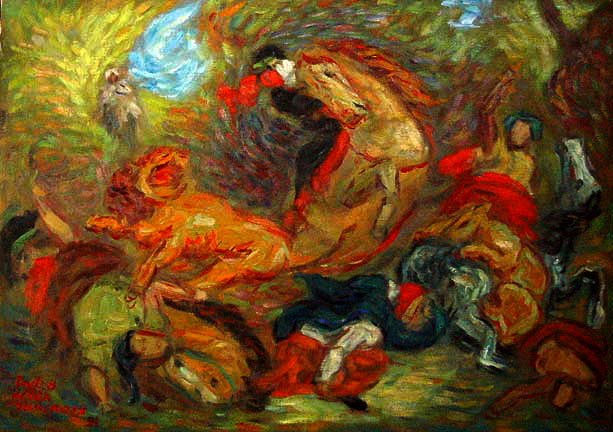 Eugene Delacroix is, for me, THE master of passionate motion, and it's nowhere more evident than in this "Lion Hunt." The swirling motion is like a cyclone. It's in a large gallery, and as soon as you walk in there you can see the motion and tell what it is even before you can see the subject matter. It's one of my favorite paintings. It's in the Chicago Art Institute, and every time I go there I can't tear myself away from it. In this representation of The Lion Hunt I've stayed true to Delacroix' composition, but with the brush strokes and color it was definitely painted in a post Monet and van Gogh world.